San Kaung Road, Ward 2.
hisk successors, the PIME Missionaries made much headway into the interior area. From the very start a tough little group of Italian Reparation Sisters worked alongside the Fathers. They helped open schools, boardings, nurseries and clinics. In recognition of the work of the Salesians, Rome soon moved fast. On 16th December 1990, Msgr. Charles Bo was consecrated the first Bishop of the newly created Diocese of Lashio. A further landmark was made in 1991, when the new Catechist Training Center was inaugurated in Lashiogyi. Under the able guidance of the De La Salle Brothers a two year special Course is given to Catechists attending from all Dioceses. In the span of some twenty years God has blessed us with new diocesan priests. Inspired by Divine Providence Bishop Charles Bo founded a Missionary Congregation of Brothers and Sisters of St Paul. Its special charism is direct evangelization 'Ad Gentes'. It started with a tiny seed of a few teenage boys and girls in 1990 and is even total a flourishing Congregation of 49 professed Religious. It spread out in 13 houses, 10 in Lashio, two in Pathein Diocese and one in Pyay Diocese. Then, Bishop Charles Bo was appointed as Bishop of Pathein on the 24th May, 1996. 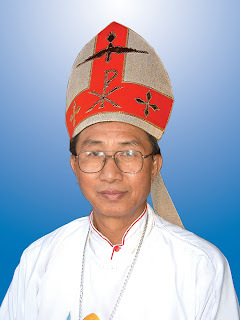 Bishop Philip Lazap Za Hawng was installed as the new Bishop of Lashio on the 4th October, 1998. On the same solemn occasion two Diocesan priests were ordained for Lashio by the former Bishop Charles Bo, SDB of Lashio. Bishop Philip Lasap Za Hawng continued to promote the newly founded Congregations of St. Paul's Brothers and Sisters. However, in 2000, the Brothers decided to move to Pathein where the founder could give close attention to their formation. The Sisters remain in the diocese of Lashio and continue to grow in numbers. There were over 70 professed Sisters in 2003. It spread out in 16 houses, 11 in the home diocese of Lashio, three in Pathein, one in Pyay and another house in the diocese of Myitkyina. In June 2005, the Novitiate of St. Paul Sisters in Lashio had been moved out from Lashio to the Archdiocese of Yagon to the wish of Msgr. Charles Bo, the Archbishop of Yangon, the Founder of the Association of the Missionary Sisters of St. Paul. During the past few years, there had been some newly ordained priests for the diocese of Lahio. In view of meeting the socio-cultural needs of many ethnic groups of the native people of the diocese, Bishop Philip, with the encouragement of the diocesan priests who are native of the diocese decided to found an apostolic soicety of The Sacred Heart of Jesus in collaboration with Sr. Maria Cao: Nao", formerly a member of the Apostolic Missionary Society of St. Paul, the Apostle.